Curl Your Lashes. Properly! Perfectly! 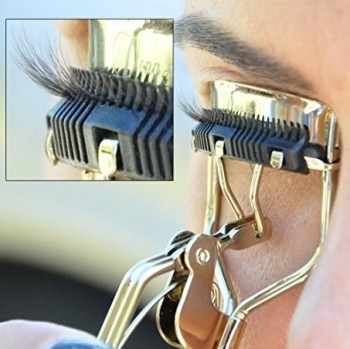 - Far the best eyelash curler, because it separates & fans your lashes out. This eyelash curler with built in comb separates your lashes smoothly and creates a perfect curl. It does the most without crimping or breaking your lashes. Unlike conventional eyelash curlers which may cause the lashes to overlap and twist in different directions, the built-in comb is designed to only touch your lashes, (never your eyes) adding extra support to your lashes as they curl, creating a proper shape as opposed to a harshly crimped shape. All metal parts are made of carbon steel, a metal that is stronger and more durable than stainless steel. The spring-loaded hinge helps regulate the correct amount of pressure applied to your lashes. Ergonomically designed handles make it easier on your hands and fingers. The handle clasp allows you to close the curler when not in use, for easy storage in your make-up bag. Always curl before you put mascara on so the makeup doesn't stick to the pad & pull your eyelashes out. The usage of an eyelash curler is not recommended for eyelash extensions. Curling them can shorten their lifetime. Step 1: Make sure your lashes are clean, dry, and mascara-free. Step 2: Open the eyelash curler. While keeping your eyes about halfway open, place your upper lashes through the curler. Position the curler near the roots of your lashes. Step 3: Gently clamp the curler together for several seconds. Your lashes will properly spread through the built-in comb, neatly and perfectly curling them. Release handles fully before removing the eyelash curler to avoid tugging of lashes. If you have many eyelashes, you may have to do this in sections. Step 4: Once done, close the eyelash curler with the handle clasp, for easier storage in your make-up bag. Step 5: For even more dramatic results, follow with XXL Lashes Luxury Mascara. A great help in simplifying the handling of the XXL Lashes extension process.